All ghoul things come to an end! 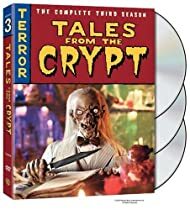 The last time you saw the Crypt Keeper...wait, this is the last time! So turn out the frights; the party's over. But first let the ghoul times roll one final gleeful time with these 13 fangtastic tales based on those classic moldy-but-goodie horror comics from back when. Among the demonic delights: Natasha Richardson as a lawyer planning a “Fatal Caper;” Ewan (Obi Wan Kenobi) McGregor gets down and zombie for a “Cold War;” and James Bond’s Daniel Craig finds out how the sneaky, freaky ad biz really works in “Smoke Wrings.” Well, time's up. Past our dead time. Never say die, friends (although we just did). Seal up the crypt. The final season is upon us! Season 7 moves the show closer to classic Hammer... and that's a good thing! Season Seven was one of, if not the, best of the series! Obviously this is not agreed upon by many of the other reviewers, but I would best that most of these people don't realize that the series was based on an EC comic book that set the bar of storytelling in comics by employing the most talented people in the industry, true masters of their craft. It wasn't just a high bar for it's era, it's a quality of storytelling that most modern artists don't understand. EC Comics are the high bar for the medium. If it were a poorer quality, and more forgettable comic series then the title would belong to the show. But the show is a good one, but not the high bar by any means for television. And it definitely has a late 80s flare, not as timeless as the comic. So when you take the show of the final season in a different direction, it might feel off to you if all you know is the tv show. 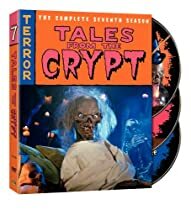 But it is as much an homage to the earlier seasons and in taking it in a different direction it makes a statement that Tales Of The Crypt is not just about 80s American camp. While the EC Comics were American (afterall, the government held hearings about them), the move to the UK is a natural one because England was the home of Hammer which are the most influential grade-B horror movies of all time. Perhaps you haven't heard of them but the people who influenced you definitely did. George Lucas afterall put the two biggest Hammer stars in Star Wars movies (Peter Cushing and Christopher Lee). And moving the show to England gave it that Hammer flare which, while different from the comic, restores some of that timelessness the comic had. That is not at all an argument that YOU should like it. 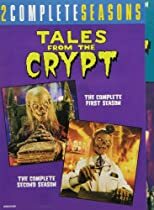 If all you knew of the show was that late 80s style and camp, and that's why you tuned in, you have a legitimate reason to be disappointed to find this season was something different. And a lot of American's don't appreciate the dry British humor. But American's are expanding their tastes. The quality is here and the change in tone makes it a more universal homage to one of the masterpieces of graphic storytelling. 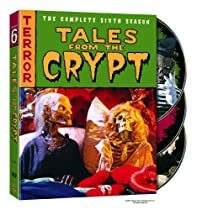 And this wraps it up; the glorious 1989-1996 seven season run of the best pay cable anthology show ever to grace the airwaves is finally complete on DVD. This season many feel lacked in detail but I completely disagree, there are quite a few gems in this finale, let me explain why it is a very unique finish to the series; the show moved production to the United Kingdom and used only a British cast of respected actors thus giving the series a different atmosphere to work with. Episodes such as "Cold War" with a young Ewan McGregor, "Horror in the Night" and "About Face" stand out just as worthy as any previous season classic. a great season and a must own. Okay, I assume that most everybody who is looking up this product on amazon is at least somewhat familiar with the late, great HBO show. So, I will limit my comments to discussing the seventh season as compared to the full run of the program. The obvious difference is that the episodes were filmed in Britain using mostly English actors. I like this change. There is something just a little more gothic about an English setting, and the actors have that wry British humor in the way they play the campy roles. It's also fun to see familiar faces from oh so serious BBC / Masterpiece Theatre dramas cutting up and having a blast with over the top horror roles. There's Imelda Staunton and Greg Wise from Sense & Sensibility, Bob Hoskins (Pride & Prejudice's Mr. COllins, and Ewan MacGregor. The first time I saw James Wilby, known for playing roles like Dicken's Sydney Carton, running around in his underwear using words that would make Charles Dicken's faint, I cracked up. This is a real hoot for Masterpiece Theatre and Mobil Mystery fans.